One find at the Boston International Antiquarian Book Fair was simply to much fun to pass up, and I did try! While I didn't buy the copy I viewed at the show, I was unable to purge the "want" from the impulse-buy center of my brain. Shortly a fine copy of Sun, Moon and Stars: Astronomy for Beginners, by Agnes Giberne, with a Preface by Reverend Charles Pritchard (Professor of Astronomy, Oxford), published by Seeley Jackson and Halliday, Fleet Street, London, 1882, will be shelved in my library. The book was first published by Seeley in 1879 and this 1882 edition is noted as the Eighth Thousand, which may mean the second printing, it may mean the 8th printing, or it may have some other meaning that I will need to figure out over time. While the copy I viewed at the book fair was lovely, it was an edition released in 1898 and priced high, I felt. I had images lined up to share but once I ordered my copy, the images on the listing page went away. For now I'll share the booksellers description of the copy on order. "Simple and lovely introduction to Astronomy filled with and inspired by Spiritual Reflections. 'to look upward through Nature unto Nature's God.' Illustrated with some beautiful Colour Paintings. 296 Pages + publishers Adverts. Olive Green Cloth Cover with bright gilt titles and sun and moon on spine. Front is similar but with planets & Galaxies as well and a picture of a shooting star. Frontis is a Colour Painting of Donati's Comet. 1858." While browsing the various listings of the numerous editions currently for sale and searching for backup information for this post, a few fun facts popped out. 24,000 copies of this title were sold between 1879 and 1899. Editions continued to appear through 1910 and the title was considered one of the best selling titles of the late 19th century. 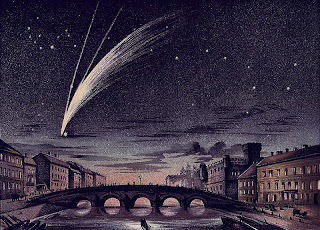 The author was an amateur astronomer and was a founding member of the British Astronomical Association.